When it comes to motivation, most managers are quite lazy! If a manager wants someone to do something, their thoughts quickly turn to one of two motivational tactics – threat or reward. Of course, very few managers actually think that this is what they are doing, in fact, if you used this type of language to describe their actions you would probably cause offense. However, when you investigate the behaviours of managers closely, you will see that behind the façade of incentivisation is really just straightforward manipulation. Again, this is a word that most managers would deny or not associate with, so let me clarify with an analogy. Imagine you have a child and you’re at the dinner table and you want them to eat their vegetables. So you think, what deal do I strike with the child in order for them to eat their vegetables? It doesn’t take long for parents to work it out. We either offer some sort of sweet or we say, “you can’t leave the table until the vegetables are eaten.” These options are straightforward reward – “if you do” options or punish – “if you don’t” options and for most parents they are effective at getting our children to eat vegetables. The question is: “Is this motivating the child or manipulating them?” Of course, it’s entirely manipulative, in both scenarios the child doesn’t want to eat vegetables they actually want the reward or they want to avoid the punishment. Bottomline: don’t treat your interns like children. The same principle applies in organisations, when we want someone to do something we are used to thinking “what can I offer them” or “what are the consequences if they don’t do it”. As a result, the primary organisational systems for getting performance from employees are bonuses and appraisals. Promotion and advancement become tools to manipulate people, rather than a commitment to the employee for their personal growth and organisational success. This is where life gets interesting for organisations using unpaid interns. Actually therefore in many ways, managers with less authority have a slight advantage in terms of motivating others because they can’t easily resort to the fear or reward systems. In fact, they have to think motivationally to have influence with that person. The best in class at managing interns will have learnt this because motivation is different. Motivation is when a person wants to do the thing and it is not conditional on reward or threat. This person is giving you their value, their time and their efforts for a reason. 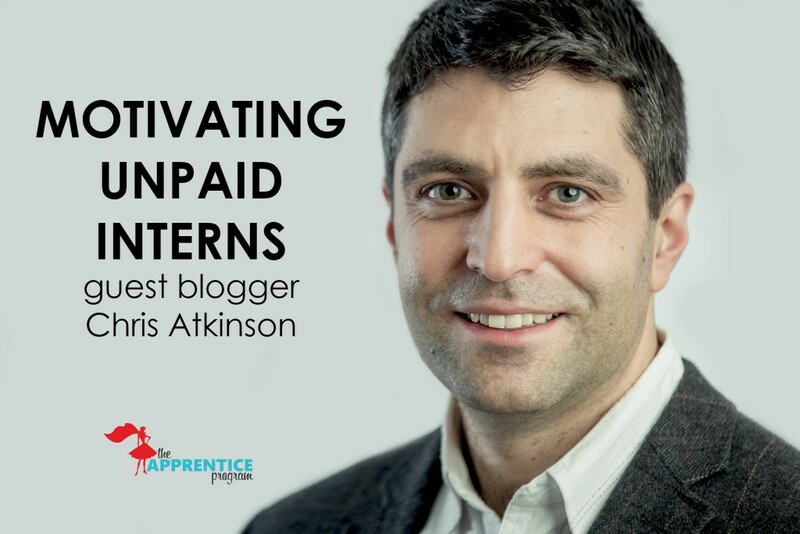 Being an unpaid intern isn’t the end point! They have a destination or dream in mind. Unless you know what that dream is, you will stand little or no chance of motivating that person. So spend significant time listening to their vision for their future, ask for details, encourage them to describe what they hope for in the future. This is not a 5 minute conversation, this is a deep, personal and powerful conversation that will build trust. Most likely, their aspirations extend beyond their current role or even your organisation. If you don’t allow this possibility and conversation to happen, they may hide important information from you. Once you’ve found out their vision, make sure the work they are doing is a vehicle to take them towards their ambition. The closer the link between their role with you and their future, the stronger their motivation will be! Here is a simple observation: people enjoy spending time doing things they are good at. In organisations, we see people volunteering for tasks or roles that give no additional financial reward, why? Because it’s fun, they enjoy it and that’s satisfying for people. If an intern isn’t naturally picking up a particular skill, stop giving them that task and find alternatives for them until you see them flourish. In this context, the word ‘personal’ doesn’t just mean giving it personally (i.e. face to face), it also means giving recognition about the person as an individual. You need to understand that saying ‘thank you’ isn’t giving recognition, it’s just common courtesy. The power of recognition is telling someone that you recognise a personal quality or talent that they have, something that is uniquely them which you value. Maybe this is two points, but no one enjoys working through a list of tasks. With interns, the danger is we treat them as if their job is to run errands and make our lives easier. As a result, we often don’t feel a need to explain to them the importance of the role they are performing and we just micro-manage their behaviour. Help them see the part they are playing and WHY it matters. Basically, you will notice that all of these tips point to one thing: Committing time. If you want the quick easy solution, use manipulation tactics, but they will only work in the short term and you risk resentment. To truly motivate people, YOU have invest time in the relationship, get to know them and value the person as an individual. It does take time, but the long term rewards are far greater and much more satisfying for all parties.